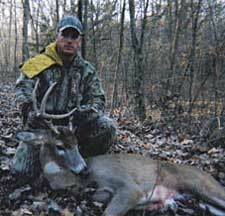 Missouri River Whitetails offers trophy whitetail deer and turkey hunting in Montgomery County, Missouri. Missouri River Whitetails has the finest whitetail deer and turkey hunting vacations in the Midwest. 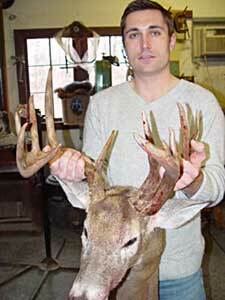 We provide guided bow hunting vacations for experienced trophy hunters. Only 6 bow hunters are allowed to hunt on the property per year. Montgomery County , Missouri, is home to one of the prime deer hunting areas in the Midwest. Missouri River Whitetails also boasts one of the most abundant wild turkey populations roaming the forests and fields in the Midwest. Access to our property is restricted to a select group of experienced trophy hunters who respect the animals. We shoot only mature animals and strictly adhere to guidelines set forth by the Quality Deer Management Association. All of our hunts are fair-chase with free roaming whitetails and turkey. The terrain is a mixture of steep hills, rolling hills, pastures and fields, so your hunt can be as physically challenging or easy as you desire. A qualified and knowledgeable guide will work with you to make your hunt safe, successful and enjoyable. Missouri River Whitetails guided hunting vacation packages has luxury lodging available for hunting parties & their guests. For more information on available dates and price quotes go to the Missouri River Whitetail's web site below.